With Super Bowl XLIX now in the rearview mirror, scores of anglers across the southern U.S. and on into Texas are ready for some of the best bass fishing action of the year to commence. As long as those six more weeks of winter weather that the pesky groundhog in Pennsylvania forecast the other day fails to materialize, at least in the southern latitudes of bass country. 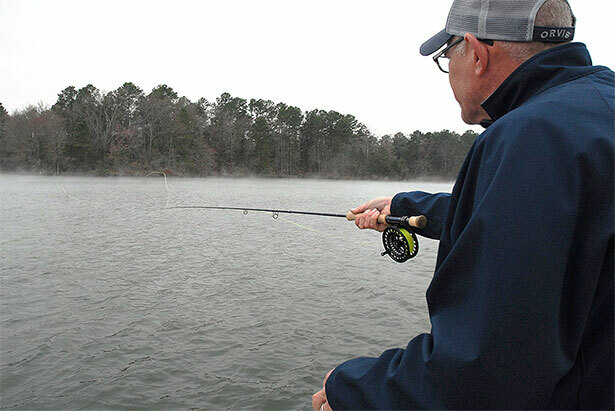 While the weather in spots from Alabama's Lake Guntersville to Louisiana's Red River and many points in between can be problematic in February, the bass fishing action often isn't. If a double-digit lunker is in your angling plans this year, that is. Take my home state of Texas, for instance, where the annual big bass blitz is fast approaching and anglers from Lake Fork to Sam Rayburn Reservoir are turning to the weather charts – and the moon charts – to see when this year’s big bass fury will be unleashed. While March and April often win the chamber of commerce vote as an angler's favored time to chase big bass, the truth is that February is just as good, if not better, at least in my neck of the woods. How good? Pretty doggone good. In fact, a glance at the Texas Parks and Wildlife Department's (www.tpwd.state.tx.us) Top-50 largemouth bass list shows that a full 14 of those Top-50 lunkers have been caught during the month when Cupid comes calling. When you consider that it takes a bass weighing 15.38 pounds to even crack the bottom end of that Top-50 list, that fact becomes even more impressive. Especially when you add in that only the month of March equals February in terms of Texas' big bass production (14 Top-50 fish were caught in both months) and that the warmer months of April (5) and May ( 5) don't even equal that number when combined. In other words, February is indeed the time to get serious about bass fishing, particularly if you want to catch a double-digit sowbelly. Rob Woodruff, an Orvis endorsed fly fishing guide (www.flyfishingfork.com ; (903) 967-2665) for largemouth bass on Lake Fork – that's right, a fly fishing guide on the most famous big bass lake in Texas – is one of those anglers that gets excited about lunker action in February. With a top personal fly rod mark of 11.75 pounds and a client best 11.33 pounds – both at Fork, by the way – the Quitman based angler is certainly not handicapped in terms of catching big bass, even if he prefers to do it with the long rod. And since a fly guide has to really be on top of his game to hook and land such fish, even a conventional tackle enthusiast can find value in Woodruff's sage advice. The first piece of advice according to the Fork guide of 20-plus years is to pay close attention to the Weather Channel. “It depends on the weather in February,” said Woodruff, noting that the full moon cycle also is an important consideration. This is especially so if there are periods of several sunny and mild days in a row. If so, the biggest bass in southern waters begin to get a bit frisky and get the spawn on their minds. When that happens, they'll make their initial move towards the bank in February, often parking in staging areas just off the really shallow stuff. But again, the February weather is a key factor in determining if and when such moves of pre-spawn fish will take place towards shallower water. And the water temperature, of course, is one of spring bass fishing’s biggest keys. In fact, the longtime East Texas resident says it just might be the biggest factor of all. Once the weatherman begins to cooperate, where should a February angler begin to search for the first wave of early spring bass fishing? In simple terms, look for areas that offer bass a transition from their winter haunts to their springtime breeding grounds. But keep in mind that while finding such spots on a map or sonar screen is important, Woodruff, a two-time finalist for the Orvis' Guide of the Year award, is looking for more than just a simple run-up to the shallows out of the deeper stuff. In addition to finding the structural migration paths on the bottom of a reservoir, he also is looking for the sweet spots of cover and underwater features that will attract such fish on the move. Since creeks bring in stained water to a lake or reservoir, and since stained water warms up quicker than clear water does, it’s easy to see why these channels provide a favored zone for late winter and early springtime bass. “Creeks, if they’re dumping warmer water into the lake, can be good places,” said Woodruff. “But if the creek is dumping cold water into the lake, it can be a pretty good place to avoid." The Texas A&M entomology graduate points to a February snow event in North Texas a few years ago that wiped out warming water trends and set the fishing back a few days on his home water. "After it melted, the water in creeks was in the 30s, while the water in main lake was in the 50s," said Woodruff. "It took a few days for it to get homogenized." 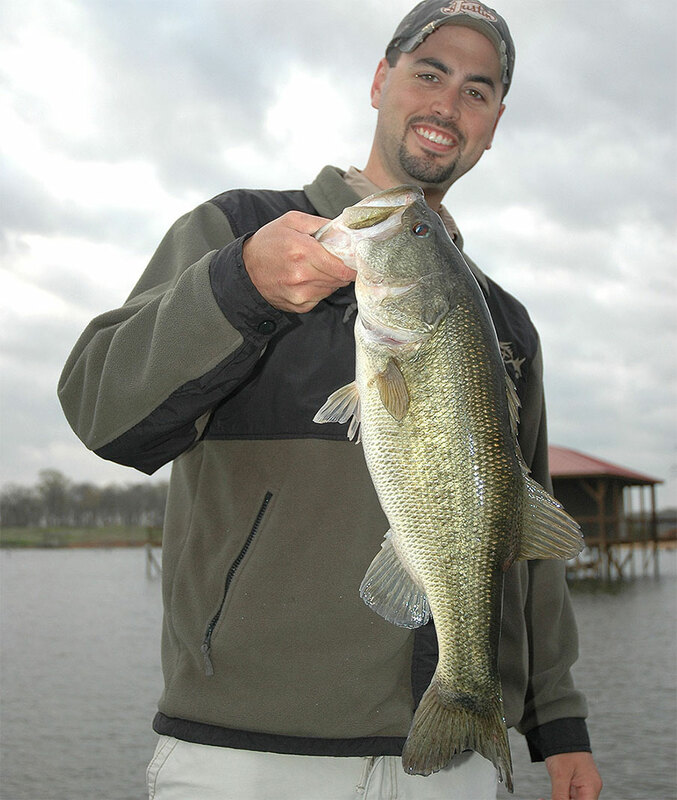 But once it did, the big bass action was back on at Lake Fork, getting better as the month of February continued and rolled on into March. Even for an East Texas bass angling enthusiast who gets the occasional strange look or two at the local boat ramp when he pulls out his particular style of fishing gear. But if there are any chuckles at the ramp, they soon disappear out on the water. That is because there's little doubt that February marks the beginning of the year's best big bass action, fly rod or not.